To kick off the New Year, I’m happy to announce a new weekly blog series that I’ll be running on Mondays, starting this week. The new series, entitled “5 Reasons” will focus on different aspects of your marketing plan, explaining why something may or may not be working. It will cover current marketing best practices, updates on technology and new opportunities, and tried and true techniques that have worked for marketers for years. Each week, we’ll address something new. 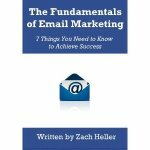 These topics will range from advertising channels, to copywriting, to email, and operations. Hopefully you will learn from each one.